Dr Chris Jenner is the Clinical Director of The Fibro Clinic. With expertise in treating over 90 different pain conditions and detailed research from around the world, Dr Jenner has developed a variety of medical treatments for Fibromyalgia. It is his belief that with the right combination of medication and complementary treatment — patients can see incredible results, and the symptoms of FMS/ME can often be reduced dramatically. With numerous years of experience, and extensive training in anaesthesia for a host of different problems, (particularly musculoskeletal pain and neuropathic pain) — Dr Jenner is known as the go-to doctor for pain. Dr Jenner qualified in medicine in 1995 from the London Hospital Medical College and has since held a number of key posts throughout London. These include Specialist Registrar (SpR) in Anaesthesia and Intensive Care and Senior House Officer (SHO) in Anaesthesia and Intensive Care at St Bartholomew’s and The Royal London and Homerton Hospitals. 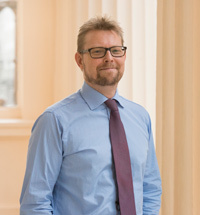 In 2001 he became a Fellow of the Royal College of Anaesthetists and in 2008 he gained certification as a Fellow of Faculty of Pain Medicine at the Royal College of Anaesthetists. He also practised as a Consultant in Anaesthesia and Pain Medicine at St Mary’s Hospital from 2004 to 2012. As a leader in his field, Dr Jenner is regularly called upon to appear as an expert witness in medicolegal disputes. He has active membership to the Association of Medicolegal Doctors (AMLED), Medical Experts Online (Sweet and Maxwell) and the Society of Expert Witnesses. A dedicated and compassionate consultant, Dr Jenner has the knowledge and expertise to treat even the most obscure of pain conditions. The Fibro Clinic has turned my world right side up again. I used to wake up every morning in pain and could never see a light at the end of the tunnel. Under your care I have seen relief I could never have dreamed of. I sleep well at night, and I live well all day. I’ve never felt better, and it’s all thanks to you and your wonderful team. "Under your care I have seen relief I could never have dreamed of. I sleep well at night, and I live well all day. I’ve never felt better, and it’s all thanks to you and your wonderful team." My Fibromyalgia made it too painful for me to work anymore, and my whole family suffered for it. I was desperate and hopeless, unable to do anything for myself or my loved ones. That is, until I found The Fibro Clinic. I now feel like a new person, free from pain, and ready to live each day to the max. I never thought i’d be able to go back to work – but here I am! Thank you so much. "My Fibromyalgia made it too painful for me to work anymore, and my whole family suffered for it. I was desperate and hopeless, unable to do anything for myself or my loved ones. That is, until I found The Fibro Clinic. I now feel like a new person, free from pain, and ready to live each day to the max. I never thought i’d be able to go back to work – but here I am! Thank you so much." I would like to take this opportunity to thank Dr Jenner for his compassionate and expert care. He stopped at nothing to find me relief from the pain that has plagued me for years. In my mind, he is truly a godsend and has enabled me to enjoy my life to the fullest once more. To anyone suffering with pain – Dr Jenner will help you. I can’t recommend him enough. "I would like to take this opportunity to thank Dr Jenner for his compassionate and expert care. He stopped at nothing to find me relief from the pain that has plagued me for years. In my mind, he is truly a godsend and has enabled me to enjoy my life to the fullest once more. To anyone suffering with pain – Dr Jenner will help you. I can’t recommend him enough." I had lived with chronic pain for so long, that I think I actually forgot what it felt like to just be normal. This all changed when Dr Jenner introduced me to trigger point injections. I can honestly say that my pain issues have been reduced dramatically. I can now do the simplest things I haven’t done in years – and I can’t thank you enough. "I had lived with chronic pain for so long, that I think I actually forgot what it felt like to just be normal. This all changed when Dr Jenner introduced me to trigger point injections. I can honestly say that my pain issues have been reduced dramatically. I can now do the simplest things I haven’t done in years – and I can’t thank you enough." Dr Jenner and Maxine Rodriguez have given me my life back and I can clearly see now after 18 months under their care how my life will get completely back to normal. "Dr Jenner and Maxine Rodriguez have given me my life back and I can clearly see now after 18 months under their care how my life will get completely back to normal." The Fibro Clinic is part of the renowned London Pain Clinic Group. Our Consultants in Pain Medicine, Dr Jenner and Dr Singh have a wealth of experience in the diagnosis and treatment of Fibromyalgia. Based in Harley Street, London, our team of award winning clinicians have access to high class facilities and to a personally chosen team of Associates to assist with your recovery and rehabilitation. Our glowing lists of testimonials provided by our patients reflect our high levels of patient satisfaction with all aspects of our service. We look forward to welcoming you to our clinic soon.